[map] [street view] East of Memorial Parkway NW on the northern side of Hollywood Boulevard SW. Co-located with WKSM. PS-song/artist ONE STATION. ALL THE HITS. Z96! Text-One Station. All The Hits. - Z96! 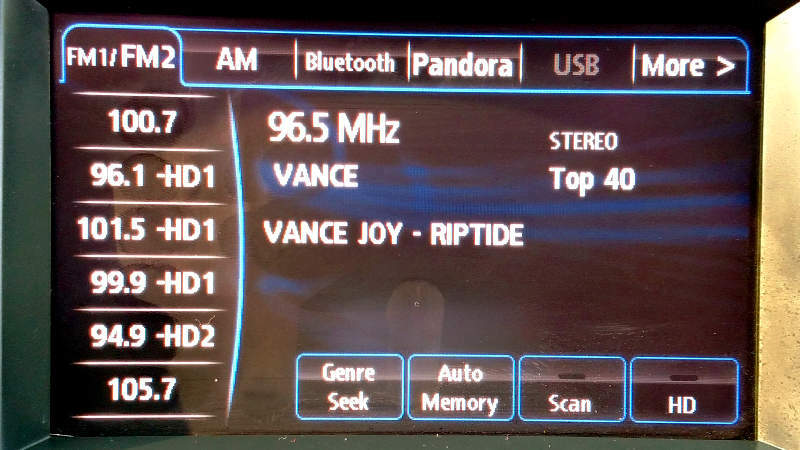 [Image] Image showing the RDS text display from a Mazda's radio, showing the PS (station name), Radio Text and PTY (format) fields. [Studio] Street View imagery of the Cumulus Fort Walton Beach studios on Hollywood Boulevard. While this frequency was allocated to the area back in the 70's, it wasn't until the late 90's that a station debuted here, due to a lengthy FCC comparative hearing involving numerous applicants. The allocation originally was for 100 kW from a site near Crestview; the people behind WKSM in Fort Walton Beach at one time had a permit for the frequency but eventually lost out or gave it up. The curiously-named Juanina Inc. finally won the permit after years of wrangling, but wound up passing it on to F.W.B. Radio, Inc., who in turn passed it along to Dothan-based Holladay Broadcasting. They got the station on the air -- finally -- in the early fall of 1997, from the current site in downtown Fort Walton Beach. They launched the station with the same calls and format that they have today: WZNS (Z Ninety Six) and Contemporary Hit Radio (CHR).